A Qualcomm Snapdragon 855 benchmark, has been spotted on Geekbench. The results’ impressive scores suggest that the upcoming chipset will offer good performance. The chipset and the device, aren’t directly named in the listing as Snapdragon 855, which instead mentions a codename for the SoC, Qualcomm msmnile for ARM64. The benchmark in question seems to have been for a phone which has 6GB of RAM, and running Android Pie 9.0. The Snapdragon 855 has 8 cores and was clocked at 1.78GHz. 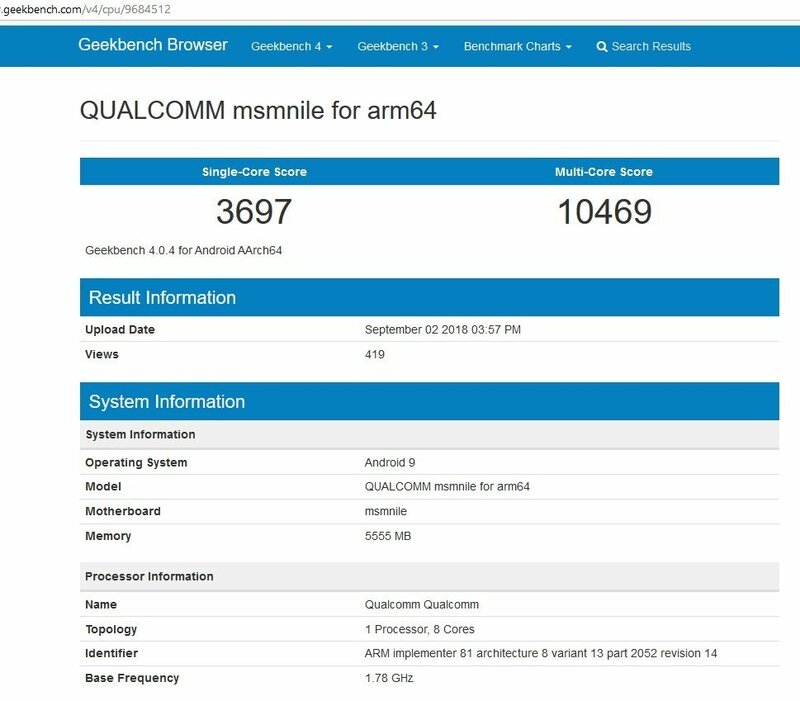 The Qualcomm Snapdragon 855 benchmark shows that the device scored 3697 points in the single-core test. This is higher than the Exynos 9810 powered Galaxy S9+’s score of 3356, and significantly higher than the OnePlus 6’s 2423 score. But, it is way behind Apple’s A11 Bionic which powers the iPhone 8, and has a score of 4219 points. Those numbers are still better than the Snapdragon 855, and those are last year’s Apple chipsets. Even the A10 and A10X Fusion chipsets from 2016, have better single-core scores than the current Qualcomm Snapdragon 845 processor. So, you can safely assume that the A12 which will power this year’s iPhones will probably beat the Snapdragon 855 easily. 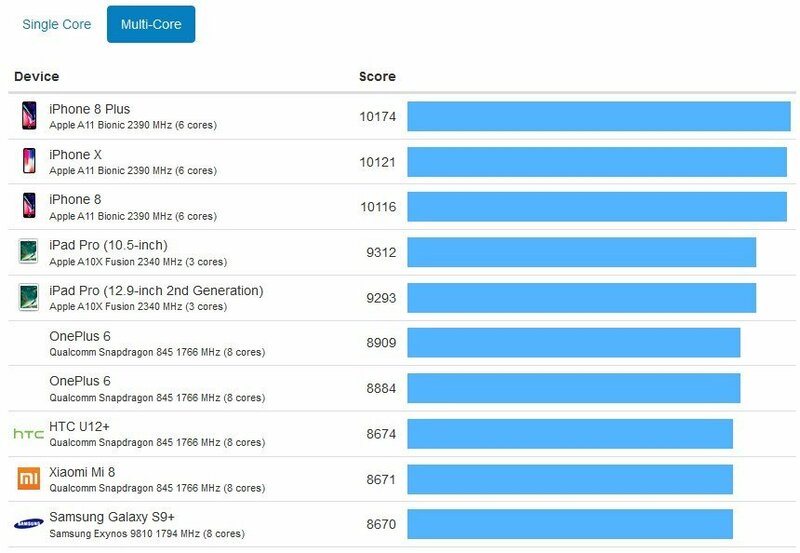 The Qualcomm Snapdragon 855 benchmark reveals a multi-score of 10469 points. Is this good? 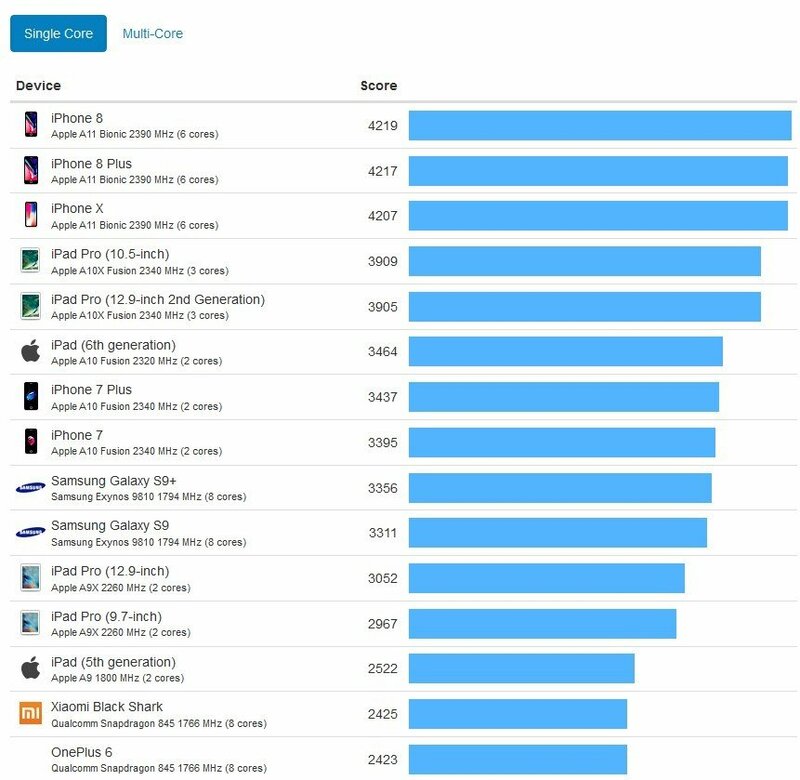 Yes, it did manage to beat the Apple A11 Bionic’s score of 10174. But that was too close. It is a major improvement over the Snapdragon 845 chipset’s score of 8909 points, which is a nice upgrade. Qualcomm has been playing catch up with Apple for quite a few years now, and there is no sign of things improving. While this isn’t good, the Snapdragon 855 could just be the start.